Put a patriotic stamp on dessert with American Spirit OREO Cookie Balls! 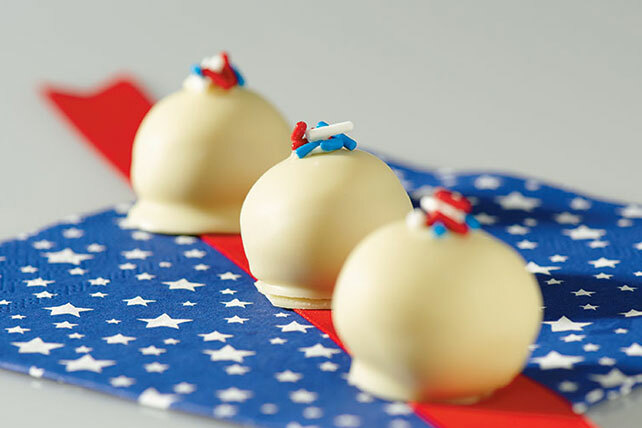 Red, white & blue sprinkles decorate these American Spirit OREO Cookie Balls. Shape into 48 (1-inch) balls. Freeze 10 min. Dip in melted chocolate; place on waxed paper-covered rimmed baking sheet. Top with sprinkles. To easily coat cookie balls with the melted chocolate, add balls, in batches, to bowl of melted chocolate. Use 2 forks to roll balls in chocolate until evenly coated. Remove balls with forks, letting excess chocolate drip back into bowl. Place balls on prepared baking sheet; let stand until chocolate coating is firm.